The 2018 Royal International Air Tattoo always promised to be a big affair as it celebrated the 100th Anniversary of the Royal Air Force. With the Countries official celebrations taking place the Tuesday prior to the show in London air forces from around the World descended on RAF Fairford for the official International celebrations. 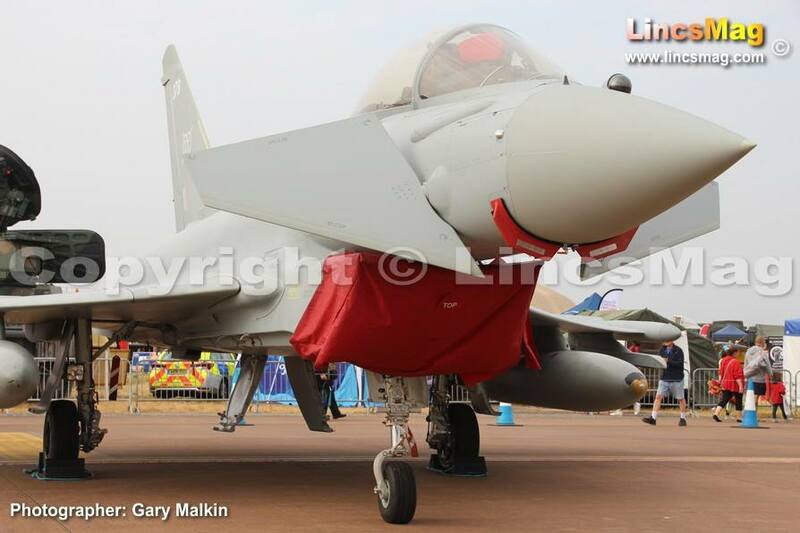 We attended the event, where the RAF contingent from Lincolnshire played a large part, on the first day of three. A glimpse of the future for the RAF was seen ahead of the show as history was made. A remotely piloted MQ-9b SkyGuardian made the non-stop flight 24-hour 2-minute flight from its base in North Dakota to RAF Fairford. The aircraft was controlled by pilots in North Dakota taking twelve-hour shifts as it flew over Canada, across the Atlantic, around Southern Ireland and making the British mainland over West Wales. The SkyGuardian is the latest version of the MQ-9 Reaper flown on operations over Afghanistan, Iraq and Syria from RAF Waddington. On entering the airfield it was another RAF Waddington based asset that greeted the public in the form of the 51Sqn RC-135w alongside the Sentinel R1 of 5Sqn and familiar Sentry AEW1 from 8Sqn. Looking across to the operational side of the hardstanding the RAF Red Arrows from RAF Scampton were lined up with the Typhoon FGR4's from RAF Coningsby keeping them company. They were to be seen in the air later in the day. As you would expect the RAF Village saw all aspects of the RAF on display from ground operations, RAF Regiment, the various sporting sections and the display teams. Here the public could meet personnel from the squadrons and get to handle some of their equipment. Replica Typhoon and Hawk aircraft were available for children to sit in while an Atlas C.1 transport aircraft was available for the public to walk through. The static aircraft from the RAF saw at almost one of each type in operation on display including King Air 350 of 14Sqn RAF Waddington, Phenom 100 of 45Sqn & Prefect T1 57Sqn RAF Cranwell and a representation of the MQ-9 Reaper as operated by 13, 31 & 39Sqn at RAF Waddington. Making what could be their last appearance at RIAT were the Tornado GR4's from RAF Marham in Norfolk, due to be retired in March 2019. The RAF contingent were joined by aircraft from the Fleet Air Arm, Army Air Corps and Qinetiq / Empire Test Pilot School RAF Boscombe Down. Other air arms from around the World joined them on the ground including Japan, Pakistan and Australia. In fact, it was Australia who sent an aircraft that could become a familiar site in the Lincolnshire skies should it replace the Sentry, the E-7a Wedgetail. Civilian aircraft represented the RAF's past with examples dating from its inception in 1918, Word War 2 and the cold war period. A full eight-hour flying display got off to a loud and fast start with the F-16c from the Polish Air Force followed up by Couteau Delta, a pair of Mirage 2000D's from the French Air Force. The first RAF display was a familiar one to Lincolnshire, the Battle of Britain Memorial Flight from RAF Coningsby with the Lancaster, Spitfire and Hurricane performing an immaculate display. They were followed up by another familiar site, the Red Arrows from RAF Scampton lead for 2018 by Sqn Leader Martin Pert. Due to cloud they were unable to perform their full high show but as usual still impressed the crowd. Both the Reds and the BBMF were due to be seen again later as part of the RAF100 flypast. Following on from them was the impressively agile Airbus A400m, Atlas in RAF service, that managed a great display in the hands of its Airbus pilot. The RAF Tutor basic trainer from 115Sqn RAF Wittering gave a good display in tricky conditions ahead of the Saab Gripen from the Czech Air Force. Two more display teams went up, the Swiss Air Force PC-7 team who also flew with the FA-18c of the Swiss Air Force before Patrulla Agulla of the Spanish Air Force. Next up should have been the US Air Force Heritage Flight consisting of the F-35a Lightning and a P-51d Mustang. Due to weather conditions the Mustang could not fly so instead we were treated to a solo display from the Lightning 56FW Luke AFB. Next up was due to be the RAF 100 Flypast, with components of the flypast seen in London earlier in the week including 22 Typhoons from RAF Coningsby and three F-35b Lightnings from 617Sqn RAF Marham. A weather front was closing in and as the rain got heavier the BBMF and Red Arrows sat on the runway ready to go as the rest of the flypast made its way to RAF Fairford. After some minutes the aircraft began to taxi off the runway and back to their parking areas and the news was received that he flypast was cancelled. Though very disappointing it was also understandable given the amount of aircraft involved. A thunderstorm was just below RAF Fairford in what was to be the flypasts exit route and the risk was just too high to go ahead. People who should have known better questioned the decision and why it couldn't be delayed until the weather had passed but the fact was a lot of planning and permission went into creating the corridor required for the flypast and delaying to a later time was not an option. After a short delay the flying resumed with the Royal Canadian Air Force CF-188 in its striking display livery. The RAF Chinook from 27Sqn RAF Odiham put on an impressive display of agility for a large helicopter. The displays continued through the afternoon before the closing section. The Italian Air Force Frecce Tricolari display team impressed, considered by many to be the closest rivals to the Red Arrows. The CV-22 Osprey from the USAF 7TH Special Operations Sqn at RAF Mildenhall gave a unique display showing its transition from aircraft to helicopter. It was then time for the noisy conclusion as the much anticipated display from the Ukrainian Air Force SU-27 Flanker took place followed by the RAF Typhoon solo demonstration flown by Flt Lieutenant Jim Peterson of 29Sqn RAF Coningsby. There was success at Sunday evenings award ceremony where the Battle of Britain Memorial Flight were awarded the King Hussain Memorial Sword for best overall flying demonstration. During the weekend they had flown their Trenchard plus formation of Lancaster, Dakota, Three Spitfires and Two Hurricanes. The Steedman Display Sword was awarded to the Red Arrows for best display by a UK participant. Though a flying display there is plenty more on the ground to enjoy with various zones. The Autodrome saw displays from various car clubs including Porsche Club GB along with the Wall of Death, old military vehicles and pedal cars for children. In the Vintage Village you could enjoy wartime style music acts, dance demonstrations, a vintage market, tea shop and bar and period displays. The Techno Zone offered a great opportunity for the young and old to learn about new technology and participate in activities. The zone is supported by leading aviation companies including Bae Systems, Lockheed Martin, Qinetiq and Fujitsu. There was also a large variety of trade stands to enjoy while most display teams also had stands to buy their merchandise. A large number of catering outlets, bars and toilets were also available around the showground when it was time for a break.